Imaginary portrait by Jan Matejko. Mieszko I ( Polish (help·info); c. 930 – 25 May 992) was the ruler of Poland from about 960 until his death. A member of the Piast dynasty, he was a son of Siemomysł, and a grandson of Lestek. He was the father of Bolesław I the Brave (the first crowned king of Poland) and of Gunhild of Wenden. Most sources make Mieszko I the father of Sigrid the Haughty, a Nordic queen, though one source identifies her father as Skoglar Toste, and the grandfather of Canute the Great (Gundhild's son), and the great-grandfather of Gunhilda of Denmark, Canute the Great's daughter and wife of Henry III, Holy Roman Emperor. While he was the first Christian ruler of Poland, he continued the policies of both his father and grandfather, who initiated the process of creation of the Polish state. Through both alliances and the use of military force, Mieszko extended ongoing Polish conquests and early in his reign subjugated Kuyavia and probably Gdańsk Pomerania and Masovia. For most of his reign, Mieszko I was involved in warfare for the control of Western Pomerania, eventually conquering it up to the vicinity of the lower Oder river. During the last years of his life, he fought the Bohemian state, winning Silesia and probably Lesser Poland. Mieszko I's alliance with the Czech prince, Boleslaus I the Cruel, strengthened by his marriage in 965 to the Czech Přemyslid princess Dobrawa, and his baptism in 966 put him and his country in the cultural sphere of Western Christianity. Apart from the great conquests accomplished during his reign (which proved to be fundamental for the future of Poland) Mieszko I was renowned for his internal reforms, aimed at expanding and improving the so-called war monarchy system. According to existing sources, Mieszko I was a wise politician, a talented military leader, and a charismatic ruler. He successfully used diplomacy, concluding alliances, first with Bohemia, then Sweden, and the Holy Roman Empire. In foreign policy, he placed the interests of his country foremost, even entering into agreements with his former enemies. On his death, he left to his sons a country with greatly expanded territories, and a well-established position in Europe. Mieszko I also enigmatically appeared as "Dagome" in a papal document dating to about 1085, called Dagome iudex, which mentions a gift or dedication of Mieszko's land to the Pope (the act took place almost a hundred years earlier). It is roughly his borders that Poland was returned to in 1945. There is no certain information on Mieszko I's life before he took control over his lands. Only the Lesser Poland Chronicle gives the date of his birth as somewhere between the years 920–931 (depending on the version of the manuscript), however, modern researchers don't recognize the Chronicle as a reliable source. Several historians on the basis of their investigations postulated the date of Mieszko I's birth to have been between 922–945; the activity of the Duke in his final years of life puts the date of his birth closer to the latter year. There are three major theories concerning the origin and meaning of Mieszko I's name. The most popular theory, proposed by Jan Długosz, explains that Mieszko is a diminutive of Mieczysław, a combination of two elements or lexemes: Miecz meaning sword and Sław meaning famous. Today, this theory is rejected by the majority of Polish historians, who consider the name Mieczysław to have been invented by Długosz to explain the origin of the name Mieszko. Today, we know that ancient Slavs never formed their names using either animal names or weapon names. Ancient Slavic names were abstract in nature. The same explanation rules out another theory about the origin of the name Mieszko, which links the name with the Polish word miś/miśko meaning bear, as no animal names were used to form honorable Polish names among Polish nobility. At that time (after Mieszko recovered his eyesight) Prince Siemomysł urgently asked the elderly people of his country whether his son's blindness conveyed some miraculous meaning. They explained that this blindness meant that Poland was blind back then, but from now was going to be illuminated by Mieszko and elevated over the neighboring nations. Poland was indeed blind before, knowing nothing about the true God or the principles of the Catholic faith, but thanks to the enlightenment of Mieszko the country also had become enlightened, because when he adopted the faith, the Polish nation was saved from death and destruction. In addition, it is known that the Slavic word "mzec" can be interpreted as "having his eyes closed" or "be blind". Yet again, today it is almost certain that this legend was used as a metaphor, in allusion to the old Slavic pagan ceremony known as the "postrzyżyny": During that ceremony hair cutting was performed to every boy at the age of seven. In that symbolic rite a child became a man. That explains that Mieszko wasn't blind in fact. He was blind only metaphorically. Besides his son's name was also Mieszko and it is hard to believe that he was also blind. In addition, as we know today ancient Slavs used only abstract names among nobility. The third theory links the name of Mieszko with his other name, Dagome, as it appeared in the document called Dagome iudex. We know this document only from a copy prepared by an anonymous monk who was not familiar with Polish language or Polish names. It is possible that while copying the document he made a mistake and wrote down Dagome instead of Dagomer or even Dagomir. The name Dagomir is used to this day and its construction is similar to other Polish names like for example: Władimir/Włodzimierz or Casimir/Kazimierz. The evolution of the "-mir" element to "-mierz" is due to two separate developments: first, the regular change of the vowel "i" to "(i)e" before "r", and second, the modification of the nominative case by the vocative for certain names (hence, Kazimierz replaced Kazimier based on the vocative Kazimierze). It is debatable whether the name Mieszko is a nickname formed from the second part of the name *Dago-mierz, since the merger in pronunciation of "sz" with the devoiced "rz" which would appear in this position is quite recent. However, some historians believe that the word "Dagome" is a melding of two names: the Roman Catholic "Dago," for "Dagobert" (Mieszko's hypothetical baptismal name), and the Slavic "Me," for "Mieszko." The Latin word "iudex" ("judge") would be used in the meaning of "prince." Another interpretation is that "Dagome iudex" is a corruption of "Ego Mesco dux" ("I, Prince Mieszko"). Mieszko I took over the tribal rule after his father's death ca. 950–960, probably closer to the latter date. Due to the lack of sources it is not possible to determine exactly which lands he inherited. Certainly among them were the areas inhabited by the Polans and Goplans, as well as the Sieradz-Łęczyca lands and Kuyavia. It is possible that this state included also Masovia and Gdańsk Pomerania. Soon the new ruler had faced the task of integrating the relatively large, ethnically and culturally heterogeneous territory. Although the residents of areas controlled by Mieszko spoke mostly one language, had similar beliefs and reached a similar level of economic and general development, they were socially connected primarily by tribal structures. It appears that the elders cooperating with the Duke first felt the need for super-tribal unity, as expansion allowed them to broaden their influence. Mieszko and his people were described around 966 by Abraham ben Jacob, a Sephardi Jewish traveller, who at that time visited the Prague court of Duke Boleslav I the Cruel. Abraham presented Mieszko I as one of the four Slavic "kings", reigning over a vast "northern" area, with a highly regarded and substantial military force at his disposal. More precise contemporary records regarding Mieszko were compiled by Widukind of Corvey, and half a century later, by Bishop Thietmar of Merseburg. By the time Mieszko I took over from his father, the Polans' tribal federation of Greater Poland had for some time been actively expanding. Continuing this process, perhaps in the first years of Mieszko's reign, if it had not been done already by his father, Mieszko I conquered Masovia. Likely also during that period or earlier, at least partially Gdańsk Pomerania was obtained. Mieszko's interests were then concentrated mainly on areas occupied by the eastern (near the Oder River) branches of the Polabian Slavs; some of them became soon subordinated by him. As Widukind of Corvey wrote, Mieszko ruled over the tribe called the Licicaviki, now commonly identified with the Polabian Lubusz Land. Having the control over those more western (in respect to the original homeland of the Polans) tribes, Mieszko had entered the German sphere of influence. In 963 the German Margrave Gero conquered territories occupied by the Polabian Lusatian and Słupian tribes, and as a result came into direct contact with the Polish state. At the same time (about 960) Mieszko I began his expansion against the Velunzani and Lutici tribes. The war was recorded by the chronicler Abraham ben Jacob. According to him, Mieszko I had fought against the Weltaba tribe, commonly identified with the Veleti. Wichmann the Younger, a Saxon nobleman who was then a leader of a band of Polabian Slavs, defeated Mieszko twice, and around 963 a brother of Mieszko, whose name is unknown, was killed in the fighting. The frontiers at the mouth of the Oder River were also desired by the German margraves. In addition, the Veleti Bohemia, which at that time possessed Silesia and Lesser Poland regions, constituted a danger for the young state of the Polans. The chronicle of Thietmar poses some problems of interpretation of the information regarding the attack of Margrave Gero on the Slavic tribes, as a result of which he purportedly subordinated to the authority of the Emperor Lusatia and the Selpuli (meaning the Słupian tribes) and also Mieszko with his subjects. According to the majority of modern historians, Thietmar made an error summarizing the chronicle of Widukind, placing the Gero raid there instead of the fighting that Mieszko conducted at that time against Wichmann the Younger. Other sources make no mention of such conquest and of putting the Polans state on the same footing with the Polabian Slavs. On the other hand, the supporters of the Gero's invasion theory believe that the Margrave did actually carry out a successful invasion, as a result of which Mieszko I was forced to pay tribute to the Emperor and also was compelled to adopt Catholicism through the German Church. The thesis that proposes the introduction of Catholicism as a result of this war finds no confirmation in German sources. The homage is then a separate issue, since, according to the chronicle of Thietmar, Mieszko actually paid tribute to the Emperor from the lands usque in Vurta fluvium (up to the Warta River). In all probability Mieszko decided to pay tribute in order to avoid an invasion similar to the one that Lusatia had suffered. This homage would take place in 965, or in 966 at the latest. Very likely the tribute applied only to the Lubusz land, which was in the German sphere of influence. This understanding of the tribute issue explains why already in 967 Mieszko I was described in the Saxon chronicles as the Emperor's friend (or ally, supporter, Latin: amicus imperatoris). Probably in 964 Mieszko began negotiations with the Bohemian ruler Boleslav I the Cruel. As a result, in 965 Mieszko I married his daughter Dobrawa (also named Dobrava, Doubravka or Dąbrówka). This political Polish-Bohemian alliance is likely to have been initiated by the Polish ruler. It is probable that the marriage was officially arranged in February 965. The next step was the baptism of Mieszko. There are different hypotheses concerning this event. Most often it is assumed that it was a political decision, intended to bring Mieszko's state closer to the Czechs and to facilitate his activities in the Polabian Slavs area. At the same time, the baptism decreased the likelihood of future attacks by German margraves and deprived them of the opportunity to attempt Roman Catholicization of Mieszko's lands by force. An additional reason could be Mieszko's desire to remove from power the influential pagan priest class, who may have been blocking his efforts to establish a more centralized rule. A different hypothesis is linked with the above-mentioned acceptance of the veracity of Gero's invasion of Poland. According to it, it was the attack of the Margrave that forced the Catholicization, which was to be an act of subordination to the Emperor, done without the mediation of the Pope. Still other motives were responsible according to Gallus Anonymus, who claimed that it was the Bohemian Princess Dobrawa who convinced her husband to change his religion. Likewise chronicler Thietmar attributes Mieszko's conversion to Dobrawa's influence. There are no reasons to negate Dobrawa's role in Mieszko's acceptance of Roman Catholicism; however crediting rulers' wives with positive influence over their husbands' actions was a common convention at that time. It is generally recognized that the baptism of Mieszko I took place in 966. The place is unknown; it could have had happened in any of the cities of the Empire (possibly Regensburg), but also in one of the Polish towns like Gniezno or Ostrów Lednicki. 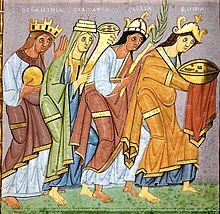 The belief that the baptism was accomplished through the Czechs in order to avoid the dependence on Germany and the German Church is incorrect, because Bohemia would not have its own church organization until 973. At the time of the baptism of Mieszko the existing Bohemian church establishment was a part of the Regensburg diocese. Thus, if the Polish ruler accepted the baptism through Prague's mediation, it had to be sanctioned in Regensburg. However, the religious vocabulary (words like baptism, sermon, prayer, church, apostle, bishop or confirmation) were adopted from the Czech language and had to come from Dobrawa's entourage and the church elements that arrived with her. Perhaps with her also came the first Polish bishop, Jordan. It could be that the reason for the Czech preference of Mieszko was the existence in Bohemia of a mission which followed the precepts of the Byzantine Greek brothers and later saints Cyril and Methodius, who developed and performed the liturgy in the Slavic rite, more readily understood by Mieszko and his subjects. The Slavic rite church branch had survived in Bohemia for another hundred years after Mieszko's baptism. Through the adoption of Catholicism, Mieszko I included his Polish state in the European community of Western (Latin) Rite states, i.e. Roman Catholic states. Consequently, neither the Holy Roman Empire nor any other Catholic country could invade Poland for the purpose of Christianizing the region, and Poland could now assert its right to be treated like other Christian states. The baptism also started the spread of the Latin culture into Poland, with the first literate and educated churchmen-advisers joining Mieszko's court. The missionary bishopric started by Jordan in 968 used the Latin liturgy and was directly subordinate to the Papacy. Churches were being built at Gniezno, Poznań, Ostrów Lednicki and elsewhere. The existence of the missionary diocese emphasized the individuality and independence of the Polish state. At the time of the reign of Mieszko, there was no single place serving as the capital, instead, he built several palatiums around his country. The most important locations were Poznań (Ostrów Tumski), Gniezno and Ostrów Lednicki. The latter was a ring-fort some 500 meters in circumference, containing the country's first monumental architecture, a stone palace used as the duke's residence. The Catholicization also led to political changes. The emergent power structures were independent of the traditional tribal elders, and limited their authority. Clergy who arrived in the country contributed to the development of education and culture, and of the state administration and diplomacy, as well. At the end of Mieszko's reign (ca. 990), Poland began to pay tribute to the pope (Peter's Pence). However, the conversion of the Polish population to Catholicism was a long-term process, and was not completed during the reign of Mieszko I. The duke probably had to deal with rebellions led by the old pagan priest caste. In some villages, the old Slavic beliefs and customs were continued until the 16th century. After the normalization of relations with the Holy Roman Empire and Bohemia, Mieszko I returned to his plans of conquest of the more western part of Pomerania. On 21 September 967 the Polish-Bohemian troops prevailed in the decisive battle against the Wolinians led by Wichmann the Younger, which gave Mieszko the control over the mouth of the Odra River. The German margraves had not opposed Mieszko's activities in Pomerania, perhaps even supported them; the death of the rebellious Wichmann, who succumbed to his wounds soon after the battle, may have been in line with their interests. A telling incident took place after the battle, a testimony to Mieszko's high standing among the Empire's dignitaries, just one year after his baptism: Widukind of Corvey reported that the dying Wichmann asked Mieszko to hand over Wichmann's weapons to Emperor Otto I, to whom Wichmann was related. For Mieszko the victory had to be a satisfying experience, especially in light of his past defeats inflicted by Wichmann. The exact result of Mieszko's fighting in Western Pomerania is not known. Subsequent loss of the region by Mieszko's son Bolesław Chrobry suggests that the conquest was difficult and the hold over that territory rather tenuous. In one version of the legend of St. Wojciech it is written that Mieszko I had his daughter married to a Pomeranian prince, who previously voluntarily was washed with the holy water of the baptism in Poland. The above information, as well as the fact that Bolesław lost Western Pomerania, suggest that the region was not truly incorporated into the Polish state, but only became a fief. This conjecture seems to be confirmed in the introduction of the first volume of the chronicles of Gallus Anonymus concerning the Pomeranians: Although often the leaders of the forces defeated by the Polish duke sought salvation in baptism, as soon as they regained their strength, they repudiated the 'Christian' (that is, Roman Catholic) faith and started the war against Christian anew. Meanwhile, the noble Margrave Hodo, having collected his army attacked Mieszko, who has been faithfully paying tribute to the Emperor (for the lands) up the Warta river. There are different hypotheses concerning the reasons for this invasion. Possibly Margrave Odo wanted to stop the growing power of the Polish state. Very likely Odo wanted to protect the Wolinian state, which he considered his zone of influence, from the Polish take-over. Possibly the Wolinians themselves called the Margrave and asked his help. In any event, Odo's forces moved in and on 24 June 972 twice engaged Mieszko's army at the village of Cidini, commonly identified with Cedynia. At first, the Margrave defeated Mieszko's forces; subsequently the Duke's brother Czcibor defeated the Germans in the decisive stage, inflicting great losses among their troops. It may be that Mieszko intentionally staged the retreat, which was followed by a surprise attack on the flank of the German pursuing troops. After this battle, Mieszko and Odo were called to the Imperial Diet in Quedlinburg in 973 to explain and justify their conduct. The exact judgment of the Emperor is unknown, but it's certain that the sentence wasn't carried out because he died a few weeks after the Diet. It is commonly assumed that the sentence was unfavorable to the Polish ruler. The Annals of Altaich indicates that Mieszko was not present in Quedlinburg during the gathering; instead, he had to send his son Bolesław as a hostage. Mieszko would never wear his outdoor garment in a house where Odo was present, or remain seated after Odo had gotten up. It is believed that in practical terms the victory at Cedynia sealed Western Pomerania's fate as Mieszko' dependency. According to archaeological research, during the 970s the Sandomierz region and the Przemyśl area inhabited by the Lendians became incorporated into the Polish state. None of it is certain for the lack of written sources. It is possible that especially the Przemyśl area, inhabited by the Lendians and the White Croats, belonged at that time to Bohemia, which supposedly extended up to the Bug River and Styr River. The Primary Chronicle states that in 981 Vladimir of the Rurik Dynasty went towards the Lachy and took their towns: Przemyśl, Czerwień and other strongholds (...). The exact interpretation of this passage is uncertain, because the Ruthenian word "Lachy" meant both the Poles in general and the southeastern Lendians tribe. Mieszko's conquest of Sandomierz could also have taken place later, together with the take-over of the Vistulans (western and central Lesser Poland). Some historians suggest that the regions of Sandomierz, Lublin and Czerwień (western Red Ruthenia) were indeed annexed by Mieszko's state in the 970s, as lands valuable for trade reasons and as a starting point for a future attack against what was to become Lesser Poland, then in the hands of Bohemia. Sandomierz under this scenario was the central hub of the area, with Czerwień, Przemyśl and Chełm assuming the function of defensive borderland strongholds. After the death of Emperor Otto I in 973 Mieszko, like his brother-in-law, Duke Boleslav II of Bohemia, joined the German opposition in support of the attempted imperial succession of Henry II, Duke of Bavaria. Mieszko may have been motivated by revenge because of the (presumably) negative verdict of the Quedlinburg summit, but, more importantly, he may have wanted more favorable terms for his cooperation with Germany. The participation of Mieszko in the conspiracy against Otto II was documented in only one source, the chronicles of the monastery in Altaich in its entry for the year 974. The Duke of Bavaria was defeated, and Emperor Otto II regained full power. Shortly afterwards, the young emperor waged a retaliatory expedition against Bohemia, in 978 forcing Duke Boleslav into submission. In 977 Mieszko's wife, Dobrawa, died. At first there were no apparent repercussions, as the Polish ruler had maintained his alliance with Bohemia. In 979 Otto II supposedly attacked Poland. Mention of this event can be found in the Chronicle of the Bishops of Cambrai from the 11th century. The effects of this expedition are unknown, but it is suspected that the Emperor did not succeed. Due to bad weather, the Emperor was back at the border of Thuringia and Saxony in December of that year. It is uncertain whether the invasion actually took place. The chronicle only stated that it was an expedition "against the Slavs". Archaeological discoveries appear to support the thesis of Otto II's invasion. In the last quarter of the 10th century there had been a radical expansion of the fortifications at Gniezno and Ostrów Lednicki, which may be associated with the Polish-German war, or the expectation of such. The duration of the expedition suggests that it may have reached as far east as the vicinity of Poznań. When Bolesław's mother died his father married, without permission from the Church, a nun from the monastery in Kalbe, daughter of Margrave Dietrich. Oda was her name and her guilt was great. For she scorned her vows to God, and gave preference to the man of war before him (...). But because of the concern for the well-being of the homeland and the necessity to secure its peace, the event caused no break of relations, instead a proper way was found to restore concord. For thanks to Oda the legion of followers of Christ became augmented, many prisoners returned to their country, the shackled had their chains taken off, and the gates of prisons were opened for the trespassers. Although Thietmar made no mention of warfare that possibly took place on this occasion, the information on the return of the accord, acting for the good of the country and release of prisoners indicate that a conflict actually did occur. The marriage with Oda considerably affected the position and prestige of Mieszko, who entered the world of Saxon aristocracy. As a son-in-law of Margrave Dietrich, he gained an ally in one of the most influential politicians of the Holy Roman Empire. As the Margrave was a distant relative of the Emperor, Mieszko became a member of the circle connected to the imperial ruling house. The King of the Swedes, Erik, entered into an alliance with the very powerful King of the Polans, Bolesław. Bolesław gave Erik his daughter or sister. Because of this cooperation the Danes were routed by the Slavs and the Swedes. Mieszko decided on the alliance with Sweden probably in order to help protect his possessions in Pomerania from the Danish King Harald Bluetooth and his son Sweyn. They may have acted in cooperation with the Wolinian autonomous entity. The Danish were defeated ca. 991 and their ruler was expelled. The dynastic alliance with Sweden had probably affected the equipment and composition of Mieszko's troops. Perhaps at that time the Varangian warriors were recruited; their presence is indicated by archaeological excavations in the vicinity of Poznań. In 982 Emperor Otto II suffered a disastrous defeat against the Emirate of Sicily. The resulting weakness of the imperial power was exploited by the Lutici, who initiated a great uprising of the Polabian Slavs in 983. The German authority in the area ceased to exist and the Polabian tribes began to threaten the Empire. The death of Otto II at the end of that year contributed further to the unrest. Ultimately the Lutici and the Obotrites were able to liberate themselves from the German rule for the next two centuries. There arrived (at the Diet of Quedlinburg) also, among many other princes: Mieszko, Mściwoj and Boleslav and promised to support him under oath as the king and ruler. In 984 the Czechs took over Meissen, but in the same year Henry II gave up his pretension to the German throne. The role played by Mieszko I in the subsequent struggles is unclear because the contemporary sources are scarce and not in agreement. Probably in 985 the Polish ruler ended his support for the Bavarian duke and moved to the side of the Emperor. It is believed that Mieszko's motivation was the threat posed to his interests by the Polabian Slavs uprising. The upheaval was a problem for both Poland and Germany, but not for Bohemia. In the Chronicle of Hildesheim, in the entry for the year 985 it is noted that Mieszko came to help the Saxons in their fight against some Slavic forces, presumably the Polabians. Otto the boy-king ravaged Bohemia, but received Mieszko who arrived with gifts. According to Thietmar and other contemporary chronicles the gift given by Mieszko to the Emperor was a camel. The meeting consolidated the Polish-German alliance, with Mieszko joining Otto's expedition against a Slavic land, which together they wholly devastated (...) with fire and tremendous depopulation. It is not clear which Slavic territory was invaded. Perhaps another raid against the Polabians took place. But there are indications that it was an expedition against the Czechs, Mieszko's first against his southern neighbors. Possibly on this occasion the Duke of the Polans accomplished the most significant expansion of his state, the take-over of Lesser Poland. Thietmar's narrative, however, raises doubts as to whether the joined military operation actually happened. The chronicler claims that a settlement was then concluded between the Emperor and the Bohemian ruler Boleslav II the Pious, which is not mentioned in any other source and is contrary to the realities of the political situation at that time. Another debatable point is Thietmar's claim that Mieszko subordinated himself to the King. Most historians believe that it was only a matter of recognition of Otto's royal authority. Some suggest that a fealty relationship could in fact be involved. Whether or not the German-Polish invasion of Bohemia actually happened, the friendly relations between the Czechs and the Poles came to an end. Bohemia resumed its earlier alliance with the Lutici, which caused in 990 a war with Mieszko, who was supported by Empress Theophanu. Duke Boleslav II was probably the first one to attack. As a result of the conflict Silesia was taken over by Poland. However, the annexation of Silesia possibly took place around 985, because during this year the major Piast strongholds in Wrocław, Opole and Głogów were already being built. The issue of the incorporation of Lesser Poland is also not completely resolved. Possibly Mieszko took the region before 990, which is indicated by the vague remark of Thietmar, who wrote of a country taken by Mieszko from Boleslav. In light of this theory, the conquest of Lesser Poland could be a reason for the war, or its first stage. Many historians suggested that the Czech rule over Lesser Poland was only nominal and likely limited to the indirect control of Kraków and perhaps a few other important centers. This theory is based on the lack of archaeological discoveries, which would indicate major building investments undertaken by the Bohemian state. Lesser Poland supposedly after its incorporation had become the partition of the country assigned to Mieszko's oldest son, Bolesław, which is indirectly indicated in the chronicle of Thietmar. Some historians, on the basis of the chronicle of Cosmas of Prague, believe that the conquest of the lands around the lower Vistula River took place after Mieszko's death, specifically in 999. There is also a theory according to which during this transition period Lesser Poland was governed by Bolesław Chrobry, whose authority was granted to him by the Bohemian duke. At the end of his life (ca. 991-92), Mieszko I, together with his wife Oda and their sons, issued a document called Dagome iudex, where the Polish ruler placed his lands under the protection of the Pope and described their borders. Only a later imprecise summary of the document has been preserved. According to the first theory the document was an effort to transform the existing missionary bishopric into a regular organization of the Catholic Church, that would cover all of Mieszko's state. This understanding implies that the arrangement led to payment by Poland of Peter's Pence. The second theory assumes that the document was created in order to protect the interests of Mieszko's second wife Oda and their sons (who were named in the document) after Mieszko's death. Bolesław, Mieszko's eldest son, whose mother was Dobrawa, was not named in the document. However, one of Mieszko's and Oda's sons, Świętopełk, also was not mentioned. Dagome iudex is of capital importance for Polish history because it gives a general description of the Polish state's geographical location at the end of Mieszko's reign. During his last years of life Mieszko remained loyal to the alliance with the Holy Roman Empire. In 991 he arrived at a gathering in Quedlinburg, where he participated in the customary exchange of gifts with Otto III and Empress Theophanu. In the same year he took part in a joint expedition with the young king to Brandenburg. Mieszko died on 25 May 992. Sources give no reasons to believe that his death occurred from causes other than natural. According to Thietmar the Polish ruler died in an old age, overcame with fever. Probably he was buried in the Poznań Cathedral. The remains of the first historical ruler of Poland have never been found and the place of his burial is not known with certainty. In 1836–1837 a cenotaph was built for Mieszko I and his successor Bolesław I the Brave in the Golden Chapel (Polish: Złota Kaplica) at the Poznań Cathedral, where the damaged remains found in the 14th century tomb of Bolesław were placed. According to Thietmar Mieszko I divided his state before his death among a number of princes. They were probably his sons: Bolesław I the Brave, Mieszko and Lambert. In 1999 the archeologist Hanna Kóčka-Krenz located what's left of Mieszko's palace-chapel complex in Poznań. The basic structure of the early Polish state was Mieszko's military force. The ruler managed to create an army composed of about 3,000 mounted warriors. This increasingly powerful force allowed the Polans to attack weaker neighboring tribes and conquer their lands. A key factor promoting cohesion of the growing state was fear of the invaders impressed by them among local populations. The first Piasts reinforced their rule by burning local strongholds and replacing them with new larger fortresses, located in strategic positions. Archaeological studies show that this practice was abandoned only at the end of Mieszko's reign, when his position was already well-established. The largest social group in Mieszko's state were free peasants (kmiecie), who cultivated their own land. They had to support the state by levies collected from them and by supporting the duke and his attendants as he traveled around the country. There were also service villages, specializing in production of certain types of items. Many trade routes went through the Polish lands, which facilitated the development of trade. Amber, fur and salt (extracted in Kuyavia and around Kołobrzeg) were exported to other countries, while cloth, crafts, tools and ornaments were imported. Unification of Polish lands. Mieszko's state was the first state that could be called Poland. He is often considered the founder, the principal creator and builder of the Polish state. Acceptance of Roman Catholicism and therefore inclusion of his country in the mainstream civilization and political structures of Roman Catholic Europe. Erection of churches. The Gniezno Cathedral was constructed during Mieszko's rule. Very likely the Duke also founded the church at Ostrów Tumski and the Poznań Cathedral. Possibly during Mieszko I's reign Poland began minting its own coin, the denarius. At the end of his rule, Mieszko I left to his sons a territory at least twice as large as what he inherited from his father. The most significant were the additions of Silesia, Western Pomerania, and probably Lesser Poland including Kraków. The first ruler to conduct efficient foreign policy, which included agreements with Germany, Bohemia and Sweden, and prudently used his military resources. Mieszko I's burial site, believed to be found in 1952 at the Poznań Cathedral, was desecrated, possibly by Bretislaus I, Duke of Bohemia, in 1039. According to a new theory, Bishop Jordan was buried here, while Mieszko's grave location is probably the Chapel of the Virgin Mary at Ostrów Tumski palatium complex. Bolesław I the Brave (Chrobry) (b. 967 – d. 17 June 1025). Świętosława/Sigrid the Haughty (b. 968/72 – d. ca. 1016), married first to Eric the Victorious, King of Sweden and later to Sweyn Forkbeard, King of Denmark. From her second marriage, she probably was the mother of Cnut the Great, King of Denmark, Norway and England. Some researchers, comparing Scandinavian, Polish and German sources state it was Gunhild of Wenden who was the daughter of Mieszko I and Oda (not Dobrawa) and who became wife of Sweyn Forkbeard, king of Denmark, England, and parts of Norway, mother of Cnut the Great, king of Denmark, England, Norway and parts of Sweden (the Anglo-Scandinavian or North Sea Empire), as well as Harald and Świętosława. She was also the grandmother of Gunhild, the wife of Henry III, Holy Roman Emperor. According to one hypothesis there was another daughter of Mieszko, married to a Pomeranian Slavic Prince; she could be a daughter of Dobrawa or of one of the previous pagan wives. Also, a theory exists (apparently based on Thietmar and supported by Oswald Balzer in 1895) that Vladivoj, who ruled as Duke of Bohemia in 1002–1003, was a son of Mieszko and Dobrawa. Although most modern historians reject this claim, Bohemian historiography supported the Piast parentage of Vladivoj. Mieszko (b. ca. 979 – d. aft. 992/95). Świętopełk (b. ca. 980 – d. bef. 991?). Lambert (b. ca. 981 – d. aft. 992/95). After a struggle for power between Bolesław I and Oda with her minor sons (Bolesław's half-brothers), the eldest son of Mieszko I took control over all of his father's state and expelled his stepmother and her sons from Poland. Jasiński K., Rodowód pierwszych Piastów, Warszawa-Wrocław (1992), p. 54–70. Labuda G., Mieszko I, (in) Polski Słownik Biograficzny, vol. 21, 1976. Wikimedia Commons has media related to Mieszko I of Poland. ^ Historical dictionary of Poland. Greenwood Publishing Group. 1996. ISBN 978-0-313-26007-0. ^ ca. 922 (O. Balzer), between 930–932 (A.F. Grabski), ca. 935 (K. Jasiński), between 940–945 (S. Kętrzyński). ^ K. Jasiński, Siemomysł, Polski Słownik Biograficzny, vol. 37, 1996, pp. 58–59. ^ see for example G. Labuda, Mieszko I, chap. III.2. ^ see for example Henryk Łowmianski, Początki Polski, Warsaw, 1973. ^ G. Labuda, Mieszko I, pp. 43–45. ^ G. Labuda, Mieszko I, chap. IV.3. ^ H. Łowmiański, Początki Polski, p. 342-345. ^ Between 965–967 according to the Monumenta Poloniae Historica ed. by A. Bielowski, vol. II, Lwów 1872; in 966 according to Tadeusz Wojciechowski. ^ G. Labuda, Mieszko I, pp. 92–97. ^ Probably not the main stronghold of the region – Wolin. G. Labuda, Mieszko I, cap. V.3. ^ Legend of the 12th century, starting with the words Tempore illo. ^ Other sources indicated that she could be Mieszko I's sister. ^ At that time, Emperor Otto I was in Italy. ^ G. Labuda, Mieszko I, p. 122. ^ J.P. Sobolewski, Niemcy, Polska a Pomorze Zachodnie w latach 971–972, "Kwartalnik Historyczny", Vol. 95, 1988, No. 1. The same argument was also given by S. Szczur, Historia Polski średniowiecze, p. 51. ^ According to the reconstruction of the battle by W. Filipiowak. ^ Historia Polski średniowiecze, p. 35. ^ The limits were described in the document issued by the bishop of Prague to Henry IV, Holy Roman Emperor. This document is preserved in the Chronicles of Cosmas of Prague and is considered a reliable copy; from G. Labuda Mieszko I pp. 148–151. ^ G. Labuda, Mieszko I, p. 160, 174. ^ G. Labuda, Mieszko I, cap. VII.4. ^ A. Buko, Małopolska "czeska" i Małopolska "polańska" pp. 153–158. ^ S. Szczur, Historia Polski średniowiecze, p. 52. ^ G. Labuda, Mieszko I, chap. VI.4. ^ G. Labuda, Mieszko I, p. 158. ^ G. Labuda, Mieszko I, p. 153. ^ It is understood that the marriage took place around 979–980 (S. Szczur, Historia Polski średniowiecze, p. 53). ^ G. Labuda, Bolesław Chrobry p. 44. ^ G. Labuda, Mieszko I, p. 134. ^ S. Szczur, Historia Polski średniowiecze, p. 54-55. ^ G. Labuda, Mieszko I, p. 168. ^ G. Labuda, Mieszko I, p. 174. ^ Thietmari chronicon, vol IV, chap. 9; Chronicles of Hildesheim, p. 986. ^ G. Labuda, Mieszko I, pp. 180–185; Marian Jedlicki, Stosunek prawny Polski, Poznań, 1939, p. 33. ^ Henryk Łowmiański, Początki Polski, vol. V, p. 563. ^ G. Labuda, Mieszko I, p. 171. ^ Andrzej Buko, "Archeologia Polski wczesnośredniowiecznej", 2007, Ed. Trio. ^ Thietmari chronicon, vol. I p. 33; argument presented by G. Labuda, Mieszko I, p. 171. ^ Henryk Łowmiański, Początki Polski, vol. V; A. Buko, Małopolska "czeska" i Małopolska "polańska"
^ Thietmari chronicon, vol. IV chap. 58; this theory is presented by G. Labuda, Mieszko I, p. 176. ^ In favor: G. Labuda, Mieszko I, pp. 172–173. ^ This theory has been presented in various forms by historians, including Robert Holtzmann, Stanisław Zakrzewski (Najdawniejsza bulla, pp. 21–23) and Henryk Łowmiański (Początki Polski, vol. V, pp. 602–603). ^ S. Zakrzewski, Najdawniejsza bulla, pp. 11–12; G. Labuda, Mieszko I, pp. 193–195. ^ In 1951 the historian Helena Zoll-Adamikowa examined the alleged resting place of Mieszko, but found no signs of burial. It's not certain that the Cathedral had already been built before Mieszko's death, and the first mention of this as his burial place comes only from the chronicles of Jan Długosz. ^ G. Labuda, Mieszko I, p. 201. ^ According to S. Suchodolski, the monetary system was installed by Mieszko I's grandson and namesake, Mieszko II Lambert. ^ Oswald Balzer (Genealogy of the Piasts, Kraków 1895) stated that Mieszko I had at least one son born from a pagan wife. The theory was based on the allegation that Mieszko's son, who was to be placed by order of Otto I in 973 as a hostage after the Imperial Diet of Quedlinburg, couldn't be Bolesław I the Brave because he was too young. This argument is refuted by Jan Widajewicz (Czy Bolesław Chrobry był w młodości zakładnikiem u Niemców?, Roczniki Historyczne, vol. XVI, 1947, pp. 243–250). Modern historians have no doubts that the Polish prince who was placed as the imperial hostage was Bolesław I. ^ According to one theory, this unnamed daughter of Mieszko I and her Pomeranian husband were the parents of Zemuzil, Duke of Pomerania. ^ J. Žemlička, Čechy v době knižecí, Prague 1997, pp. 72–73. This page was last edited on 12 April 2019, at 20:02 (UTC).